This week we are having so much fun that I have barely had a second to type up what we've been up to! We kicked off our Toddler Winter Games on Monday! 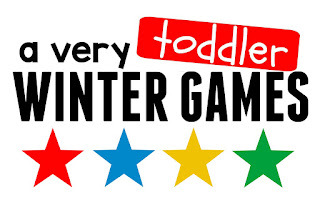 The Toddler Winter Games features FIVE DAYS of super simple and fun winter sports themed activities. The games in South Korea are fast approaching and we want to make sure you have a great time while you share them with your family. During the Toddler Winter Games, we'll be sharing a new activity every day! On Monday we did Animal Bobsled races and yesterday we did Lid Hockey. I usually will post our activities on Instagram first and then I'll follow up with a blog post here with more details. You can follow me at @kristinatoddlerapproved. I've teamed up with Susie of Busy Toddler or this series, so make sure you follow her too at @busytoddler. Did you know that you can hot glue Little People and not completely maim them? Grab some craft sticks, a hot glue gun, and your little people and glue them all together! I glued the two sticks together first and then glued them to Ariel & Cinderella. Any princess will work though! Next, create your easy ramp with a box, packing tape, and a piece of cardboard. I got a few pieces of really straight cardboard at Kelly-Moore for 40 cents. Our Amazon box supply has dwindled since my husband is a little too quick getting rid of them! NOW YOU'RE SET TO PLAY! Everyone took a turn racing these Little peeps. It was fun to make predictions about who would win. We worked on teaching my toddler to follow directions... since she loved to start racing her before we said "GO!"... thus winning every time. She still has a long way to go, but once or twice she stopped and raced alongside her sister. Trying out different characters with different sizes and shapes can be cool too. You can also grab any other toys, like Paw Patrol buddies, Dinotrux pals, or even Switch & Go Dinos... and go launch them down the ski ramp. Take some surveys ahead of time about which characters are going to win/go the fastest. 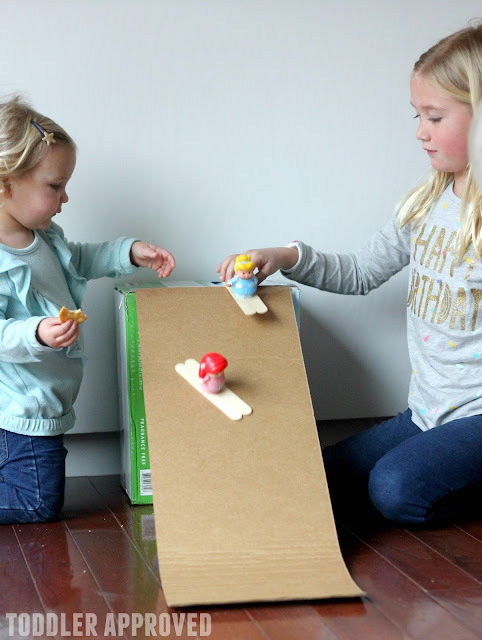 This is such an easy hands on physics activity to let kids experience! What characters would your kids launch down the ski ramp? Have we done an activity with your favorite winter sport yet? So far we've hit hockey, bobsledding, and skiing!